This pedagogical professional development in the framework of “Training in the Ecology” is one of the pioneer projects of the Keszthely Training Centre. The project is aimed at educators. Kindergartens are oases where parents like to stay because of the atmosphere. Many mothers and fathers turn to the teachers with their personal worries and look for advice. At the same time the teachers also want the co-operation of the parents, so they organise all sorts of events with and for families. 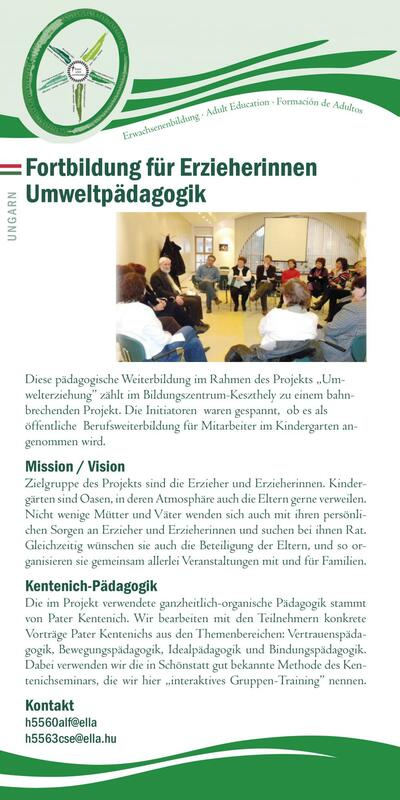 The holistic and organic pedagogy used in the project is taken from Fr Kentenich‘s teaching. The project offers samples of that teaching. Together with the participants we work through some of Fr Kentenich‘s talks on the subjects: pedagogy of trust, pedagogy of movement, pedagogy of ideals and pedgogy of bonding. We make use of the well-known Schoenstatt methods of a Father Seminar, which we call “interactive group training”.